● Each RBC HMT/DNMT is fully evaluated with a gold-standard radioisotope filtration binding assay using an array of potential substrates. ● In addition to a simple study of enzyme activity progression curve, Michaelis-Menten kinetic parameters are also determined with at least one optimized substrate. ● Each protein is tested with a group of commercially available inhibitors to evaluate their potencies as references. 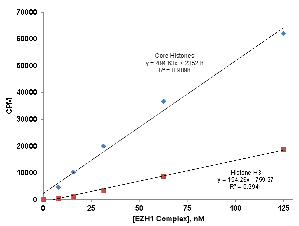 Methyltransferase Activity of the EZH1 Complex. Methylation determined as TCA-precipitable counts in in a scintillation/filter plate assay. Reactions were 60 min., 30°C, 1 μM [3H]-SAM with 5 μM histone H3 or 0.05 mg/mL core histones. 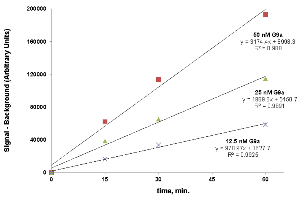 Time courses of G9a methyltransferase reactions in the HotSpotSM assay format. G9a, at the indicated concentrations, was assayed with 0.05 mg/mL chicken core histones and 1 μM [3H]-SAM. Signal/Background ranged from 4.3 (12.5 nM G9a, 15 min.) to 51.2 (50 nM G9a, 60 min.). 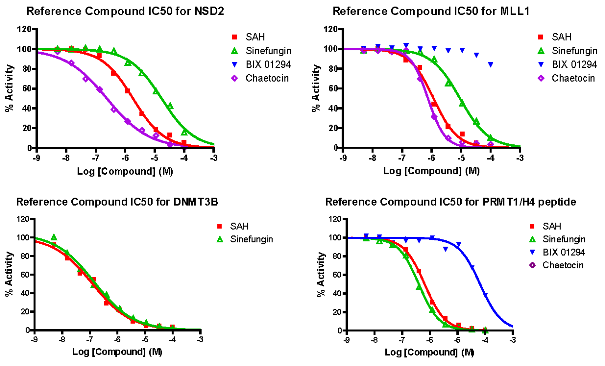 Each enzyme is validated by testing control compounds for each substrate.